Make a picnic checklist. I keep one in our basket with the essential items I need to remember; this way I won’t forget the football or deck of cards, or that I need to bring a knife in order to cut the sandwiches in half. There is nothing worse than getting to your picnic spot and realizing you forgot the plates or something equally important. If you are meeting friends check in with them to make sure you know who is bring what, as well as where you are meeting. Choose a great location. These guidelines will help you get it right: Know where the restrooms are; if you have young kids pick a spot near one. If you are planning on bringing a ball or Frisbee, choose a spot with enough room to eat and play. 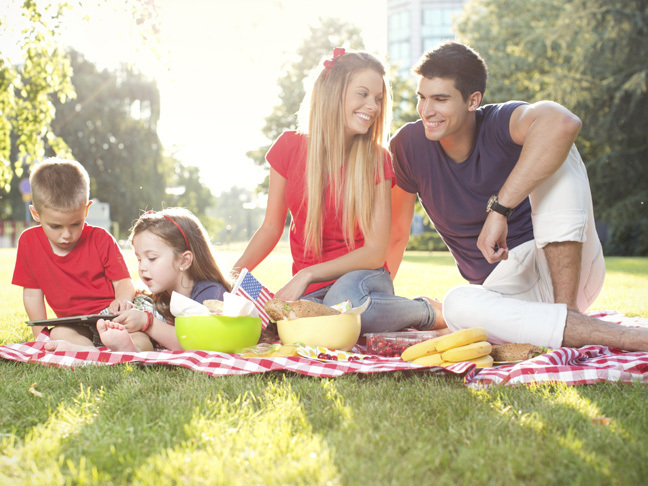 Check the rules of your picnic area, and make sure they mesh with your plans. Some parks do not let you have alcohol, some do; some have rules against amplified music or organized team sports. Pack eats that everyone loves. This sounds obvious, but it may require some sleuthing ahead of time if you're picnicking with friends. Also, be sure that you pack enough food for everyone. Some of our picnic favorites: roasted kale chips, deli sandwiches, chocolate chip-oatmeal-coconut cookies, and fresh cut-up fruit and veggies (don't forget the dip!). Map out some fun activities. Bring a football, Frisbee, and/or baseball and bat and have a friendly game. Let older kids use your digital camera and send them on a scavenger hunt to photograph things like a rock in the grass and a purple flower. A deck of cards is also a great idea if kids need a little downtime after running around all afternoon. Protect yourself against the elements. My kids are really sensitive to the sun so I make sure I have hats as well as loads of sunscreen with us. I also always pack extra sweatshirts in case we're out into the evening and it gets cold. Bug spray is another must. And don't forget the umbrellas in case of rain!